It may seem like a daunting or puzzling task at first, but taking great photos of a meteor shower is simple and can be done with a bit of effort and even the humblest of camera set-ups. This is especially true for meteor showers such as the annual Geminids or Leonids; sometimes these can be more like storms with hundreds of meteors blazing across the night sky. In this guide, we’ll show you how to get the best results when aiming your camera at the skies of the world. Capturing meteor shower memories on camera? We'll show you how. Have specific questions about anything related to meteor showers? Ask us directly! Follow the standard column if you want a pretty good chance to capture the show with only basic equipment, moderate if you plan on purchasing or already have a wide-angle lens at your disposal, or pricey if you’d don’t mind buying extra equipment. Standard camera lens The standard 1-55mm (digital) or 28-80mm (film/full frame digital) lens that came with your camera. Also called the stock lens. SLR camera Using a digital or film SLR enables you to take long exposures. Also produces images with low-noise levels. In comparison, the vast majority of point and shoot cameras are severely limited for shooting during the night. A tripod Tripods are a must. Without one, even the slightest of movements will ruin the shot. Locking cable release/remote switch Using a locking release cable/remote will enable the camera’s self-timer mode to shoot a single shot all night long or until your battery dies out. Also, no camera movement. Wide-angle lens An ultra-wide starting in the 8-12mm (digital) or 16-20mm (film/full frame digital) is even better. The more you can fit in the frame, the greater the chance of catching a meteor. Large memory card 8gb to 32gb card recommended if you’re shooting from a DSLR in RAW format instead of JPG. Otherwise, shooting in JPG format with a 4gb to 8gb card should be fine. Tracking equatorial mount Enables you to track the stars as they rotate. The mount slowly rotates the camera in sync with the Earth’s rotation, therefore preventing star trails during the shoot. AC adapter Having an AC to DC converter will eliminate the need for batteries and fears of the camera dying during the shoot. If you don’t have one make sure you fully charge your batteries prior to shooting. 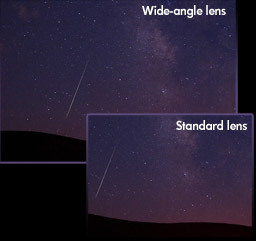 Much of the basic equipment required to photograph a falling star is the same required to capture the moon, lighting, and even fireworks. You will need a manual film or digital SLR camera that will let you manually adjust the exposure and that has either the T (timer) or B (bulb) functions. You’ll also need a solid tripod and a locking cable release (otherwise known as a remote shutter release). Additional equipment such as an AC adapter, large memory card, wide-angle lens, and a tracking equatorial mount are optional but may improve the outcome of your photos, time, and overall shooting experience. Two of the most important factors that will determine the outcome of your photographs are the time you began shooting and the location your chose. Make sure there are clear skies: Check your local forecast before heading out to photograph or watch the meteor shower. If there's a suitable forecast consisting of clear skies — locate a dark sky location. Although your forecast may not be for 100% clear skies, heading out to observe the meteor shower will still be worthwhile. If the forecast is for overcast, fog, rain, snow, or any type of precipitation, just stay in bed and have a lovely rest. Find the darkest spot available: If you live in a large, bright city with an abundance of lights, your chance of shooting a meteor shower are going to be slender. While you'll still be able to see the meteor shower from within the city, you'll only be able to successfully photograph it from a location many miles away from city lights. For best results, try to get at least 50-75 miles from the nearest major city. The purpose behind this is to avoid the sky glow from city lights because you’ll be taking long exposures. In an urban location with a bright sky and a bright street light-illuminated foreground, the exposure is limited to only a short period before the brightness overwhelms your images. Your ability to remove yourself from the ambient light of cities and towns will have a massive effect on the overall success of your photography. Beware of the full moon: Sometimes a meteor shower with a high Zenithal Hourly Rate (ZHR) is anticipated, but it falls under the same date of a full moon. In a case like this, the moonlight is abundant enough to overexpose your photos. Know your meteor shower: There are several major meteor showers every year. Among them are: Geminids, Perseids, Quadrantids, Orionids, Leonids, Aquariids, and Lyrids. Each other them gets their name from the constellation in which they appear to originate from, otherwise known as their prime radiants. For example, Orionids will appear to originate from the constellation Orion, Aquariids from Aquarious, Geminids from Gemini, and so forth. Once you have decided which meteor shower you’d like to capture, check out dedicated page for the meteor shower on Spacedex for detailed information including the peak date, best viewing time, and dark sky viewing areas for select locations. If you don’t know where the constellations are in the sky, consult the constellation map below or a night atlas to help determine your shooting direction. 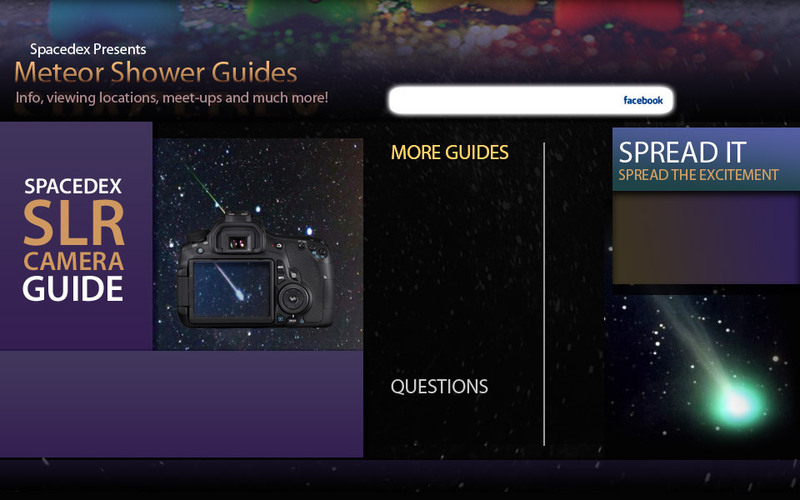 You’ll have to aim your camera toward the radiant of the meteor shower. If this seems complex, you can wait for the shower to begin and point at the direction where you see meteors whizzing from. Aim your lens at about 45 degrees away from the prime radiant. This way you'll capture as much of the meteor trail as possible. With a 21mm — 28mm lens this will allow you to capture the prime radiant where they first appear and the full length of the meteor trails. Cameras to use: Any camera with a shutter than can take time exposures can be used. Set the camera to B (bulb) or T (timer) and set it up on the tripod. Be sure to use a locking cable release to absorb the star-light. If your manual film camera has an electronic shutter check if it also has a long time exposure mode that doesn't draw current. Otherwise, put in fresh batteries and plan on replacing them the next day. Mechanical shutters are preferable for long time exposures for this reason. If you have a Canon EOS 35mm SLR then this is a good excuse to pick up that TC-80N3 timer release you wanted but couldn't figure out when you'd use. Lenses: You'll likely want to use the widest and fastest lens that you have. If you have something like a 21mm f/2.8 that would be ideal. The reason for this is twofold. Firstly, you want a wide lens because you want to show as much sky as possible as well as something recognizable as a foreground silhouette. This could be a lake, some trees or a house. Without a foreground subject what you'll have are just white streaks on film. A fish-eye lens would be a good idea if you have one. Prime lenses are better for this type of photography than are zooms, but if a zoom is what you have use it. Don't bother with anything longer than about 50mm. The exposure times will need to be too short, to avoid blurred star trails, as discussed below. ISO Rating/Film Speed: Film speed, aperture and shutter speed are of course all interrelated. We'll look at the each separately, but make your plans in the context of understanding how they combine to affect what you can achieve. You can use any film speed from ISO 100 to 400. 800 or higher is simply too grainy and isn't needed. If you will be using an f/2.0 or faster lens then 100 speed film will be OK. If your lens is slower then 400 is preferable. You can use color transparency, colour negative or B&W, though negative films are preferred because of their greater exposure latitude. There is not likely to be much colour so something like Ilford XP2 Super will give you good speed (ISO 400), reasonably fine grain, and convenient processing. Aperture: The faster the better. But, don't just use your lens wide-open. Try stopping down at least 1 stop for some frames. So, if you're using an f/2 lens, stop down to f/2.8. The reason for this is that lenses are least sharp wide open and also suffer from coma at wide apertures. Coma is the inability of a lens to render a point source as a point, particularly at the corners of the frame. Instead they will appear to be smeared. Since there will be stars in your shot, which are of course point sources of light, any coma will be less visible if you're stopped down a bit. Shutter Speed: This is the most complex of factors to be considered. You want a long enough exposure so that you capture a good number of meteor streaks, yet not so long that the stars themselves start to streak. Because of the Earth's rotation during the course of even a minute or less, any time exposure that includes stars will show them as streaks instead of points of light. This means that with a 24mm lens any exposure of longer than 25 seconds will show the stars as streaks rather than points of light. The frame above shows what I mean. This was taken with a 15 second exposure using a 50mm lens. According to the formula (600/50=12) a 12 second exposure was the maximum that wouldn't show star streaking. And sure enough, even the few seconds more used for this exposure starts to show slight streaking. You'll also see above that a 15 second exposure at f/2.5 and ISO 400 was more than enough to record the brighter stars. Meteor trails are often brighter than this (though many are fainter). My suggestion though is to go for some really long exposures. 30 minutes or so. This way you'll be sure to capture a lot of meteor trails and the stars will start to look like trails rather than streaks. It's an esthetic judgment. If you're going to be doing 30 minute exposures you can afford to stop down another stop or two or even three. This will give you sharper images with less coma. Also, unless you are in a really dark sky environment it will help to cut down in the affect of sky glow. Tripod: It goes without saying that you should use as large and as heavy a tripod as you have available. And a cable release. Clothes, Comfort & Accessories: Since it's mid-November, dress warmly. Bring a thermos of something hot. The trick for keeping warm is to wear a warm hat and scarf. The greatest heat loss is through the head, and the body's temperature sensor is at the back of the neck. That's why your mother told you to wear a scarf. Keep your head and neck warm and the rest of your body will feel fine. Thin gloves are a good idea too. Focusing: At infinity, of course. Remember to check that your lenses are racked over to their infinity stop before starting a series of exposures. It's easy to make this mistake in the dark. P1. You get much more sky coverage when using a wide-angle lens. •	Use a wide angle lens or wide setting with zooms( this increases your likelihood of success. Watching a meteor shower consists of lying back, looking up at the sky ...and waiting.